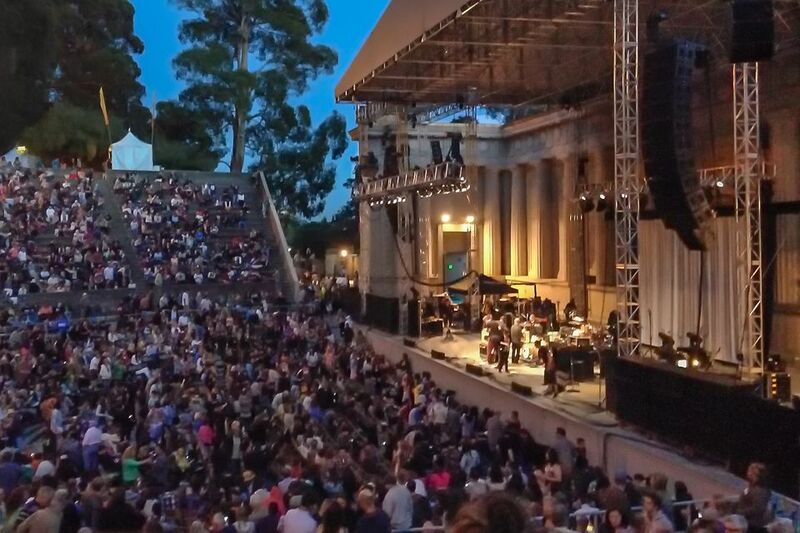 The William Randolph Hearst Greek Theatre, known locally as the Berkeley Greek Theatre is among the best places to see a summer concert in California. The Greek Theatre structure is more than 100 years old, constructed in a gorgeous, classic style. Its hillside location has great views of the San Francisco Bay and parts of the university campus (but only from the very top of the property). Some concerts at the Greek Theatre are offered through Cal Performances, but others are organized by promoter Another Planet Entertainment (APE). The mix of performers is eclectic. Artists performing there in the past have included Yo-Yo Ma, Placido Domingo, John Fogerty of Creedence Clearwater Revival, John Legend, Radiohead, and Idina Menzel. At the classical music performances, Berkeley audiences are quiet and attentive and nice to each other, but they are not always punctual. In fact, so many people may arrive late that it delays the start of the performance. Everyone agrees that the views from the Greek Theatre are spectacular, with views of the university campus, Golden Gate and Bay Bridges, San Francisco, and – on a clear enough day – Mount Tamalpais in Marin County. Before you buy your tickets, know the layout. Unfortunately, you might feel like a need a degree from the university next door just to understand it. Depending on the concert, the entire place may be general admission only, while for others all seats are reserved. General Admission-only performances give you the flexibility to dance close to the stage or watch from farther back. Seating is first-come, first served for those shows and Greek Theatre veterans recommend arriving early so you can be first in line. To get inside faster, use the gate up the hill next to Bowles Hall instead of the one near the box office. For some shows, only the seats near the stage are reserved and for others, the second tier is also reserved. The lawn area is always general admission. The flat floor area near the stage is called The Pit. The lower tiered sections A through F have folding seats. A row of concrete "throne seats" runs along the top of the first tier. The upper tiered sections - 1 through 10 - are backless, like sitting on large concrete steps. Seats in row 20 (the top row) have a wall behind them to lean on, but it's chillier up there because it's less sheltered – and if you're in the seats on the sides, outside noise can creep in from the street below and even from the railroad across town. The grassy lawn area is behind and above all the seats. It has the best views of the surroundings and is closest to the bar and restrooms. The summer concert season runs from May through October. Everyone must have a ticket, and no strollers are allowed. Tickets for many APE shows go on sale on Friday at 10 am. The best way to get advance notice of upcoming shows is to join their mailing list. To find out everything that's playing, you need to make two stops: Check the Berkeley Greek Theatre schedule and check the Cal Performances schedule for shows at the Greek. For Cal Performances, you can tickets in advance at the Cal Performances Box Office at Zellerbach Hall on the University campus, with no fee. The Box Office at the Greek Theatre is only open on the performance day – 1.5 hours before show time – for tickets sales and will call pickup. Seats in the numbered sections are on concrete steps with no backs or cushions. No matter what kind of cushion Mother Nature may have provided you, something soft to sit on is a must. Cushions are available for rent, but for a steep price. Doors open for most shows open 1.5 hours before show time. If you're sitting in the concrete step section, it's best not to get there too early - it just extends the amount of time you have to sit. Food is available for sale, but you can also bring your own as long as you carry it in an approved container. Check the Greek Theatre website to find out what items you can bring with you – and what you can't. The upper sections have lots of shallow steps and no handrails. If your mobility is limited, it may be better to choose a seat in a lettered section. The Greek Theatre is wheelchair user accessible. The ramp is in front of the Ticket Office, and there's a drop-off point at the North gate. The theatre is at 2001 Gayley Road in Berkeley, near the University of California campus. You can to the Greek using BART, but It's about a mile walk to the theatre from the station on Shattuck, which will take about 20 minutes. Some Greek Theatre veterans suggest parking on the nearby streets instead of the parking garages. It's a strategy that can save you money, but it's not a simple thing to figure out. Spots will be scarce when something else is happening on campus. Parking for part of your visit may be free, even when there's a meter at the curb. But Berkeley parking enforcement is strict, and you need to be sure you don't overstay the time limit and that the meter is paid until the fees are lifted.